29 May Where are the winter lambs coming from? Winter officially arrives next week, and with it, we expect lamb slaughter to decline from recent record highs. Traditionally lamb supply throughout the winter is sustained by the last of the old season lambs, and the arrival of new season spring lambs out of NSW in the second half of July. With the dry continuing, we ask whether these lambs will finished on time, and whether they’ll be there at all. Lamb supply has been exceptionally strong so far this year, and we know that it has been a factor of fewer lambs being killed at the end of last year and dry weather forcing some sales. We know that NSW becomes the major supplier as we move into winter. But as the dry in NSW continues, and grain prices rise, there is some doubt as to the number and condition of winter lambs. Meat & Livestock Australia (MLA) have released the February MLA and AWI Wool and Sheepmeat Survey Report with little fanfare, and it gives us a few clues. Firstly, the data in the Wool and Sheepmeat survey appears to be quite volatile. This is likely due to the number of sheep producers filling out the survey being around 10% of the total number of producers. It’s a good sample, but results can move around depending on who has time to do the survey. The survey does show some interesting trends. 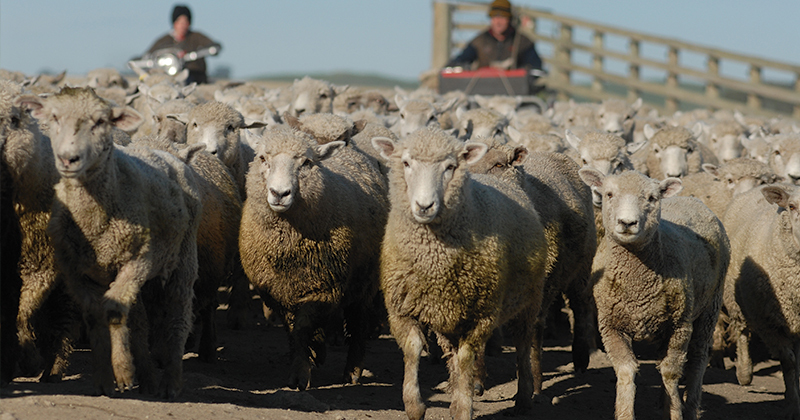 Figure 1 shows the number of breeding ewes on hand for both Merino and ‘Other’. According to survey results, the Merino Ewe flock hit a seven year high in February, with just under 32 million head roaming Australia. This is a 19.7% increase on February last year, which seems a little over the top. They do split the Merino flock into those joined back to Merinos, and those joined to ‘other’ rams. 22.1 million head (up 24% year on year) are to be joined to Merinos, and 9.8 million (up 10.4%) to be joined to other. The ‘other’ ewe flock, which consists mainly of breeds used for lamb production, is down 9.4% on February 2017. The total number of ewes (Merinos and Other) on hand, as of February, to be joined to a breed other than Merino is down 1% on last year. This tells us that there should be a lot more Merino lambs born this year, more first cross lambs, and less ‘other’ lambs. The survey data on lambs born from November to February somewhat confirms the ewe data. November to February is the smallest lamb marking period, but it’s still worth looking at the data. 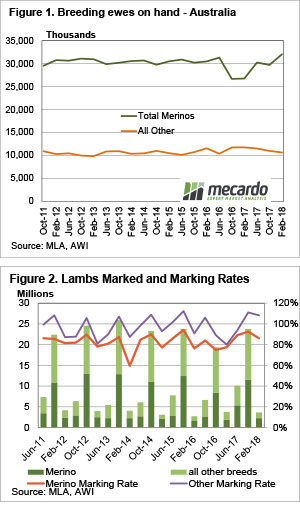 There were apparently 3% fewer lambs marked over summer (figure 2) compared to last year, but Merinos were up a massive 21% to 2.25 million head, and ‘other’ down even more, 27% lower at 1.04 million head. Around half the lambs marked from November to February were Merinos in NSW. If we consider that there were apparently fewer ‘other’ lambs marked over summer, is suggests lamb supply at this time of year should be waning. Last week we concluded that a lot of NSW is likely to have been grainfed, so some of these lambs might have exited the system already. More importantly, there are fewer ‘other’ ewes to producer the early new season spring lambs which appear in saleyards in July. These lambs would have been born in March and April on little feed, which doesn’t bode well for survival or growth rates. It suggests fewer and lighter lambs to fill the June, July and August supply void.